My motto for Tool Time Tuesday is to always think outside the box. For me, that "box" usually means finding something in the clearance bin and saying...hmmm, what else can I use this for! I haven't cross stitched in years and gave all my supplies away, but I still couldn't pass this package up with the big red clearance sticker! They're plastic too, so they'll last forever. or because they're plastic, you can use a permanent marker and just write on them. Grab a key ring. The kind that hinges open are much easier. Hook the bobbins on the key ring and you are all set. 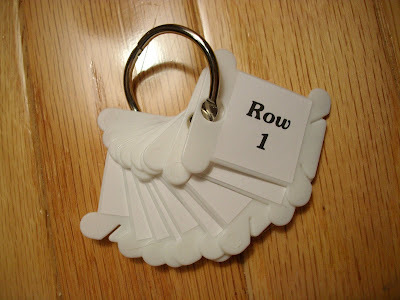 You now have a set of quilt row markers to keep each row organized and in order. 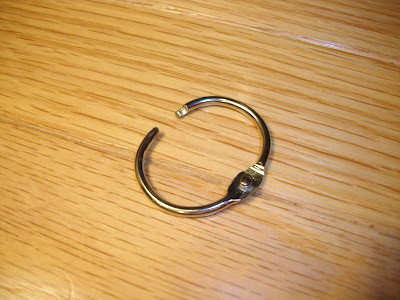 Just use a safety pin to attach to the fabric through the hole on the plastic bobbin. 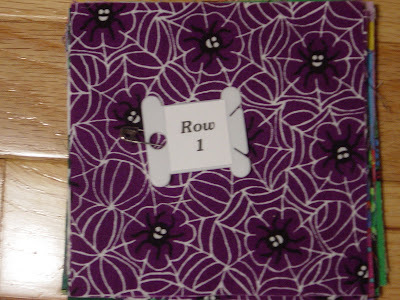 Here's the close up of the pinned row marker and a close up of some of the "I Spy" fabric. 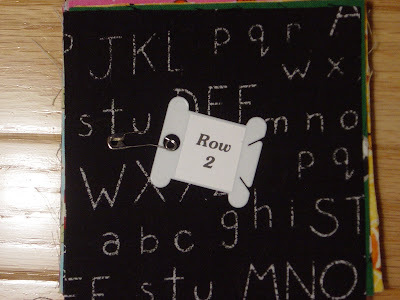 Isn't this chalkboard fabric cute? and here's some Halloween fabric. I still have a lot of these tags left, so I'll be thinking more on this one. My minds still a ticken' so I'll let you know if anything else comes to mind or if you think of some, let us know. ps. 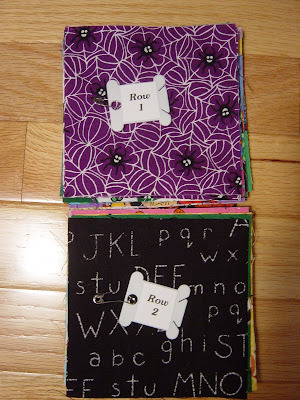 I'll be updating the interest in the I Spy Swap on Wednesday. That is definitely a wonderful idea!! I usually mark with a post it note, but this definitely saves paper. Another great idea Karen, I have to look for those. Yeah or yeah!!! I love this idea. 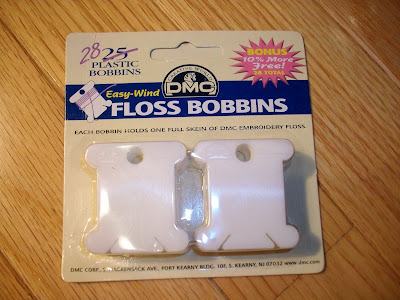 I just picked up some of these floss holders at the thrift store a couple of weeks ago. I also have not cross stitched in ages, but it was a good price and I thought there had to be some way to use them. YEAH!!! I love this idea! I'm going to use it! And seriously...you should write a book! Duh! Lightbulb moment! What a fantastic idea. Bloggers are such smart people and I'm glad I know them! Very smart idea!!! Thanks for sharing! 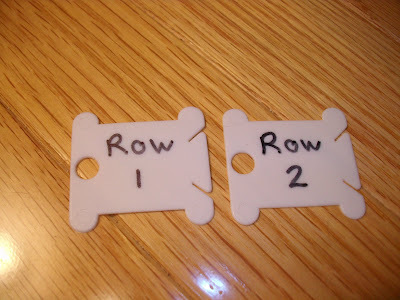 I will be checking out all the bargain boxes now for these plastic bobbins. Fantastic idea. Will share with my quilting friends. 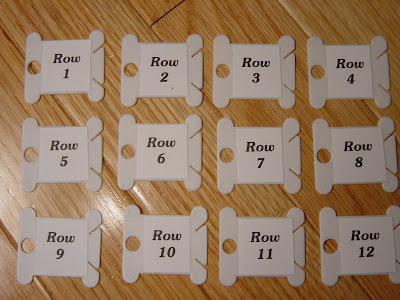 Like I said, you are so clever....I love it...I usually just put one straight pin in for row one, then two for row two etc....this is alot better...but can't find those here...will have to store the idea until I get tot he states. Great idea Karen. I was using post-its and they always ripped and fell off! Your brain must tick over constantly, I'm amazed by what you come up with. This is a good one. Hey! I've got some of these...great idea AGAIN!! 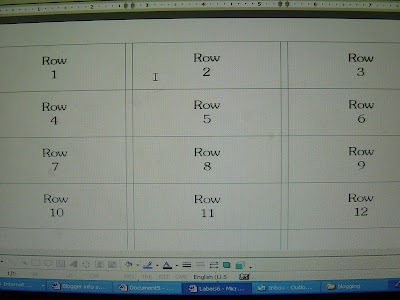 I have an even easier way to mark rows. I put a piece of masking tape on a safety pin and folded it over on itself so the sticky was all covered. Then I wrote numbers on each tape - cheap and effective! You've done it again. Your ideas are sew amazing! 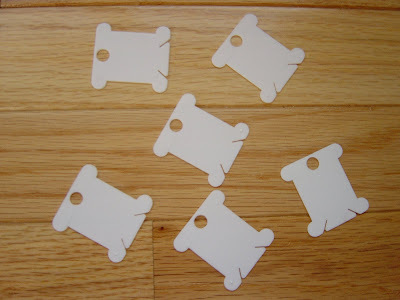 I use the cardboard version of these to keep earrings organized.